The Cartwright family (from left) Nick, Kent, Lynne, Brent and Heidi spend time together at Cleveland Clinic a few weeks ago. Less than two months ago, Tiffin resident Kent Cartwright was driving a school bus and working. His condition deteriorated rapidly in the past seven weeks. 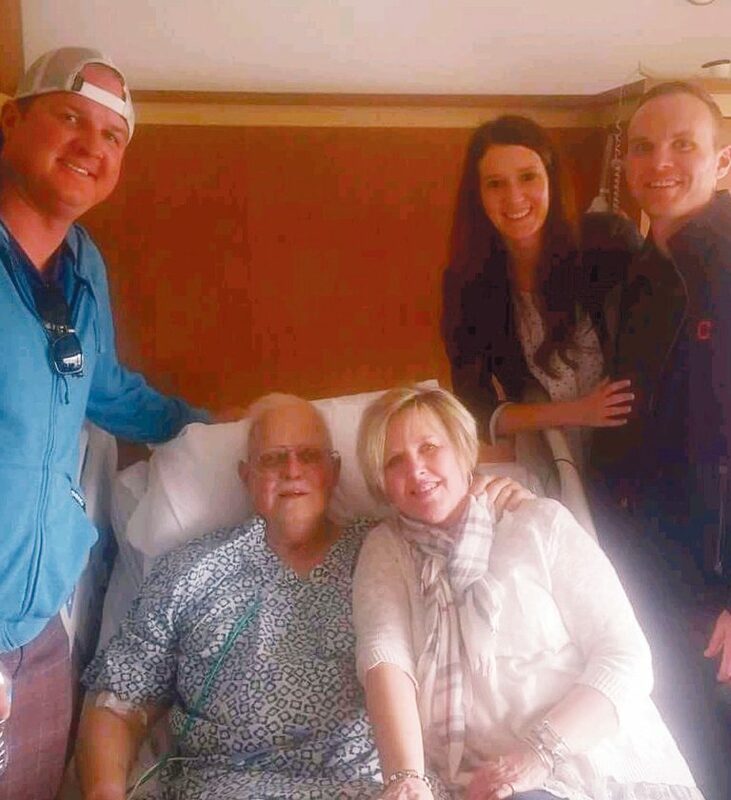 His family — wife, Lynne; sons Nick and Brent; and Brent’s new wife, Heidi — were gathered at Cleveland Clinic over the weekend. Father’s Day was spent sitting, watching Kent breathe, Lynne said. Kent had gone under hospice care Saturday. “He made that decision himself,” she said. Lynne said Kent graciously lived with prostate cancer for 10 years. He was diagnosed with pulmonary fibrosis caused by chemotherapy. He experienced a decrease in lung function, and his lungs were damaged beyond repair, Lynne said. Crews had been trying to get the fibrosis under control. “God had other plans for him,” Lynne said. Lynne said the family has seen a decline in his condition since Brent got married Friday. “He was holding out for Friday,” she said. Kent told the doctor, “You don’t have to be sorry,” Lynne recalled. “I am a man of faith. I believe in the resurrection. I know where I’m going,” Lynne recalled him saying. Four people in the room held hands, and the doctor said a prayer. The family had just received devastating news, and the doctor asked Brent, who was planning to get married June 16, whether he’d be interested in getting married at the hospital so his dad could be part of it. Kent wanted Brent and Heidi’s already-scheduled wedding to be the legal ceremony, so the couple had a marriage blessing ceremony at the hospital, Lynne said. The hospital staff planned the ceremony in the chapel for June 9, and it had a program, music and a boutonniere made out of Post-it Notes for Kent. Brent and Heidi’s photographers for the ceremony June 16 made the trip from Toledo to photograph the marriage blessing ceremony June 9. Heidi recalled Kent giving her and Brent words of advice. He told them never to take things for granted, she said. She said Kent also spoke directly to her, sharing how much joy it brings him to see how much love she and Brent have for each other. The couple’s wedding was Friday, and Kent was able to watch the ceremony and some of the reception from his hospital room thanks to a live feed. He spent the time with a few friends. Lynne had ordered a six-inch cake. “They had wedding cake,” she said. Lynne said she is amazed at the care and the caring that goes on at Cleveland Clinic. “He has touched so many people. … This place is special,” she said. Lynne said she has told crews at the hospital, “You are so human. Lynne said the people at home have been gracious, and she has so much paying forward to do. She received money and gift cards, and people have mowed her lawn, are taking care of her animals and are watering flowers. It is incredible how friends have stepped up, she said. Lynne said Kent’s doctor at Ohio State University did a great job of keeping Kent healthy. Kent did well with two rounds of chemotherapy and developed a cough on the third round, she said. One thought it was bronchitis, and the doctor thought it was pneumonia. Kent spent three weeks at OSU’s James Cancer Center before being transferred to Cleveland Clinic. The cure is what is claiming Kent’s life. “The cancer was being managed. … It’s all due to the drug,” Lynne said. Lynne said they would have time to prepare if it had been a chronic disease gradually getting worse. But, the disease hit him and took him down, she said. Brent said his father was driven and never one for mediocrity. He was a teacher and always helping other people, Brent said.